Her Royal Highness The Princess Royal, Princess Anne, visited the University today, meeting with Principal Suzanne Fortier and other academic leaders, as well as with students, including five MasterCard Foundation Scholars currently enrolled at McGill, academically talented young people from Rwanda, Uganda, Ghana and Nigeria; and students in McGill’s International Development programs. 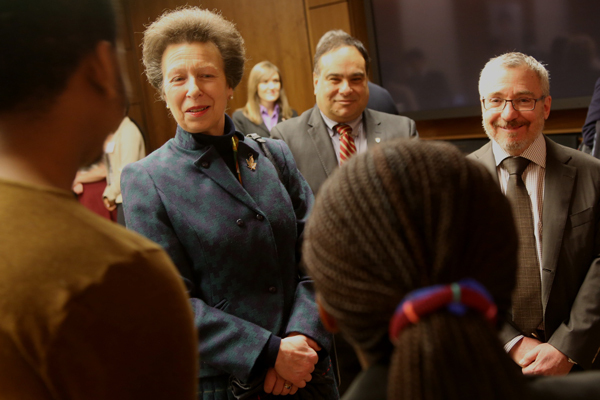 The Princess Royal, Princess Anne, meets with students while Eli Turk, Director of International Relations, and Phil Oxhorn, of the Institute for the Study of International Development, look on. / Photo: Owen Egan. When Queen Elizabeth II and the Duke of Edinburgh visited McGill in 1951 as part of their first cross-Canada tour, 10,000 members of McGill’s community filled bleachers on lower campus to greet them as they arrived in a classy light blue convertible. Greeted by Principal Suzanne Fortier and Stuart Cobbett, Chair of the McGill Board of Governors, and Rosie Goldstein, Vice-Principal, Research and International Relations, The Princess Royal, Princess Anne, spent the majority of her brief visit to McGill today speaking with 30 students involved in international development work and leadership initiatives. This included four MasterCard Foundation Scholars (Emmanuel Edeh, Ignace Nikwivuze, Emefa Agbeshi, and Jean Kagame), academically talented young people from hailing from communities in Rwanda, Uganda, Ghana and Nigeria, who are currently enrolled at McGill; and two students from World University Service Canada, an organization which assists refugees to study at McGill. The students were impressed by her wide-ranging knowledge of issues related to international development. Peter Nshimiyimana, an undergraduate student in the Faculty of Arts, took the opportunity to discuss his hopes for his future. “I talked about where I am from [Rwanda] and what I am interested in doing, and the potential of my career having an effect on the world – I’m interested in international development and social work – my motivation is to give hope to the needy,” he said. Ifeyinwa Mbakogu, a PhD student in Social Work whose studies focus on child trafficking said her conversation with Princess Anne centered on one of the most popular conversation topics in Canada: the weather. Princess Anne is actively engaged in charity work and is the President of the Caribbean-Canada Emerging Leaders’ Dialogue. The Emerging Leaders’ Dialogue connects emerging leaders from different countries, across labour, business, government, NGO’s and civil society, during two week programs where participants go into communities and workplaces to discuss challenges, systems and solutions to global issues. Phil Oxhorn, the founding Director of the Institute for the Study of International Development (ISID), spoke with the Reporter in advance of the royal visit about the developing ties between Emerging Leaders’ Dialogue and ISID. “ISID’s mission is to help students become better global citizens by exposing them to new and interesting opportunities abroad and helping them develop respect for different ways of thinking and living,” said Oxhorn. As part of ISID’s mandate to build bridges between McGill and the international development community, ISID has been collaborating with ELD in a number of ways over the past few years, including identifying best practices in the field of leadership learning and the development of knowledge networks. The Institute for the Study of International Development in conjunction with the MasterCard Foundation will host an international conference from March 19-21. Should I Stay or Should I Go? Maximizing the Contribution of Higher Education to Development in Africa will examine the effectiveness of programs that provide scholarships to promising students from Africa. Find out more here.